Rejection is as much a part of life as acceptance. Sometimes, it’s the caveat that predicates our path to success. Radio and TV personality, Toke Makinwa has dished out words of encouragement to every young dreamer who have been rejected at one point or the other. 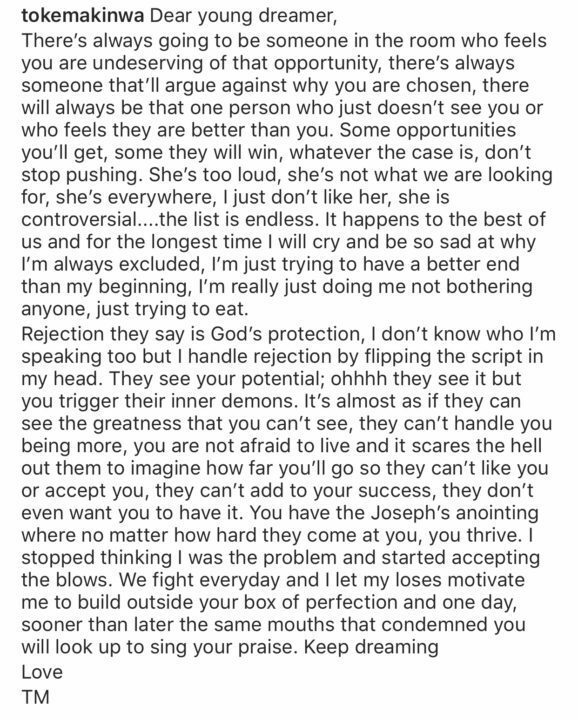 In her words, Rejection is God’s protection. 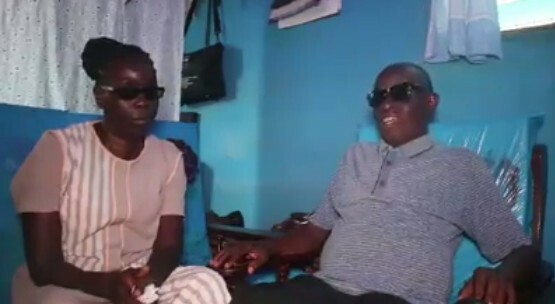 She added that there’s always going to be someone in the room who feels you are undeserving of that opportunity, there’s always someone that’ll argue against why you are chosen, there will always be that one person who just doesn’t see you or who feels they are better than you, whatever the case is, Toke advised that you should not stop pushing. In a post she shared via Instagram, the media girl and fashionista, 34, disclosed that she was also rejected at some point in her life. According to her, she would cry and be depressed after being rejected. Amazingly, she says she can now handle rejection by flipping the script in her head. There’s always going to be someone in the room who feels you are undeserving of that opportunity, there’s always someone that’ll argue against why you are chosen, there will always be that one person who just doesn’t see you or who feels they are better than you. Some opportunities you’ll get, some they will win, whatever the case is, don’t stop pushing. She’s too loud, she’s not what we are looking for, she’s everywhere, I just don’t like her, she is controversial….the list is endless. Rejection they say is God’s protection, I don’t know who I’m speaking to but I handle rejection by flipping the script in my head. They see your potential; ohhhh they see it but you trigger their inner demons. It’s almost as if they can see the greatness that you can’t see, they can’t handle you being more, you are not afraid to live and it scares the hell out them to imagine how far you’ll go so they can’t like you or accept you, they can’t add to your success, they don’t even want you to have it. You have the Joseph’s anointing where no matter how hard they come at you, you thrive. I stopped thinking I was the problem and started accepting the blows. We fight everyday and I let my loses motivate me to build outside your box of perfection and one day, sooner than later the same mouths that condemned you will look up to sing your praise.